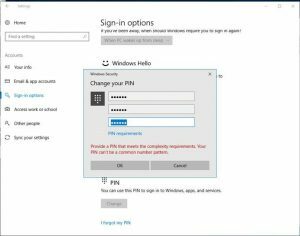 Have you ever encountered the following warning when creating a new PIN for Windows Hello? If so, have you ever wondered what logic is used to distinguish a ‘common PIN pattern’? Common number patterns are PINs that have the same difference between multiple digits in the PIN. For example, in 123456 the difference between the adjacent number is 1 in all cases, so it’s blocked. In a nutshell, a simple PIN algorithm is used to look for and disallow any PIN that has a constant delta from one digit to the next. This prevents repeating numbers, sequential numbers and simple patterns. They both ‘contain’ a constant delta, but only within a subset of the complete interval. As the algorithms only look for a constant delta across all intervals, both of these PINs would be acceptable.